The bedding situation at the transition home was...luxurious. Downy comforters, pillows, a stuffed animal or two...which makes for a cozy, warm, soft environment for sleeping babies. Here, we worry about suffocation. So, I have lovingly placed my baby in the sterile pack and play. When he got tired of that, I started laying him on his side. The side thing alone was the solution for about a day. One night, he kept waking up. No, that sentence isn't strong enough. Every single stinkin' time I let my hand off of his back. He would flop his arm over and his eyes would fly open. Argh, the frustration! I've got things to do (like dishes, reading books to the older four, laundry...), I can't stand all night long with my hand on his back. Frantically, I looked around the room. What could I possibly do to keep him asleep? I saw the answer--a teddy bear that sits on my dresser. It was perfect. Within arms reach and big enough to fake Josiah out. I know, "Teddy bear on her dresser? I underestimated your flaky factor, Apryl." This isn't just any old bear. My grandpa died almost three years ago. He had the opportunity to love on each one of my older three kids. We brought Ella home shortly before he got sick. The first time he met her; he was in the hospital. He never knew of our decision to adopt again. He was a very distinctive man; a full-time farmer with a law degree. I remember him in a button down blue shirt working on the farm (or watching the news). The shirts were soft and thin from wear. A woman from hospice told my grandma that she would make her some bears from his old shirts. My grandma took her up on the offer, and the one she gave me sat on my dresser. Tonight, Josiah woke up, rolled over, and looked up at me. Then, just as I was about to pick him up, he reached out and patted the bear's head until he fell asleep. The doctor's visit was a bust. We learned very little, but not because of the doctor. She seems to be the perfect individual for dealing with what we may have going on. Salomae has a pretty bad case of kyphosis. The x-rays show that 4 of her vertebrae have been affected. They are being "eaten up" from the inside out and currently resemble wedges instead of the nice cubes that they should be. She hunches over a little as a result and has a visible lump in her back. According to what we know of her past 9 months, the kyphosis only became apparent in the past 3 months. Which means her situation is digressing rather quickly. The pediatric orthopedic surgeon that we saw last week is going to do a biopsy to see what we are dealing with. Salomae will have to go under general anesthesia for the procedure, because he's inserting a large needle into the middle of her back. She's also going to have an mri done relatively soon so we can see how close the deterioration is to her spinal cord. The specialist was surprised that she wasn't suffering any neurological deficit as a result. After yesterday's appointment, her case has been put on the fast track. Thank you for all of your prayers regarding her health. She's indeed a very healthy kid (serious medical issues aside). I'll keep you updated as we learn more. Wish I had more to tell you, but once again don't want to tell you one thing and it end up being something else. Praying that we get the ball rolling as soon as possible. I wish I could rattle off a list of things I've been doing over the past week as an excuse for not blogging. I can't! In my on and off blogging I've probably reduced readers down to my sister and my addicted friend in Mobile (you know who you are). I do appreciate you two! We are maintaining a level of sanity, cleanliness (unless you count yesterday), and happiness that I wasn't expecting before we came home. By the end of the day all of the maintainance on my part has me totally worn out. Then, evening comes and I get to wake up twice to keep the chunky monkey...well...chunky. Occasionally, one of the older four children will do the muscial bed routine with Seth and me. It's pleasant--three bodies crammed into the double bed. Real cozy. Josiah wants to sleep with us, and usually he gets his wish at about 3 am. My mommy mind is so groggy that I...just...want...sleep. He sleeps with his legs and arms spread eagle, by the way. I kick the older child out of bed to make room for the baby. Does it sound like it's nuts? If you saw me you would probably say I look tired. I am tired. I'm also happy. All of the kiddos are doing well. Today, Salomae and Eli had a true brother-sister moment. They fought. It was so sweet. They are becoming best buddies (though a lot of what I say is sarcastic, this really isn't, Eli is the favored sibling). Which is completely unexpected. That said, this afternoon, we put up bunkbeds in the girls' bedroom and that become serious bonding time. Ella and Salomae were dancing around the room singing, "We got bunkbeds!" Oh, happy day! They have been in bed for 2 hours and they are probably still awake with giddiness. On the medical front: we will see a specialist tomorrow for Salomae. I'm planning on posting afterward to give everyone the full scoop on what we are dealing with. I haven't wanted to go into detail and have to recant what I said. So I've waited. Sorry, I think most of you have wondered and worried since the situation seems to be shrouded in mystery. It's not exciting. It's not communicable. Hopefully, prayerfully, it's not as bad as we are expecting. I think, honestly, I've been lax in posting because I still can't get my mind around everything we saw in Ethiopia. I'm busy, but three weeks later, I still find my mind reeling from our experience there. I keep looking at our kids with disbelief. I don't remember having these moments with the older three kids. Poor Josiah, I can hardly keep myself from covering him in kisses everytime I hold him. He laughs and laughs. Salomae probably thinks I'm weird. She starts jabbering all the English she knows at me, "Daddy, ciao, work? Fettie, banana? Juice? Mommy? Shoes? Jacket? Bye, bye, church?" It lasts a while, because she returns to the beginning of the routine and just starts over. I just stare at her as she talks. I'm astounded at her ability to overcome all she's been through. Occasionally, I find myself with my hands on her cheeks. Just because she's here. This weekend Josiah got his first tooth. He's a trooper, I hauled him all the way to North Carolina and he was an angel the entire weekend. I didn't realize that I had such a flirtacious boy on my hands until he had three women on the airplane going bonkers over him. Today, I was rocking him before his nap and was struck by how much he has changed in the past month. I don't want to bore you with a list of all the incredible baby things he's doing right now. So, I'll just give you some cutie-patootie pictures of our ever-changing boy. Mealtime is number one priority. It takes a lot to maintain that physique! In the first photos, he's so pleased about sitting in his little seat. Little does he realize he's about to taste green beans for the first time. Didn't go over so well. I discovered that (like big brother Eli) Josiah will eat any table food I put in front of him. Baby food...why bother? Probably shouldn't have fed him that portion of garlic mashed potatoes at the wedding reception. Good thing he missed my dress and only lightly splattered the floor and stroller. I've been meaning to write something along these lines for at least a week. Other things came up...mainly parenting five children. And that last post. Yuck. I'm leaving tomorrow with Josiah, and I can't bear to think of that being the post that sticks around all weekend. So I'll leave you with this. Thank you! From the deepest depths of my heart, thank you. We have been blessed in so many ways over the past few months by you. You have prayed for us and encouraged us. I sat in a hotel room in Ethiopia crying over the words you wrote as an encouragement to Seth and I during a hard few days. It was a blessing to know that so many of our friends and family were lifting us up to God during a trying time. We were able to pour out blessings on orphans in Ethiopia because of the generosity of many of you. I wish I could adequately describe what we saw and each person we met while there. Thank you for enabling us to bless those dear children. You have cooked for us. Oh, the sweet sound of the doorbell at dinnertime! Thank you! I've felt bad accepting meals, but it was such a blessing. I came home to a lasagne in the fridge and flowers on the porch (thank you, my friend!). We've been showered with gifts for our new kids (and our already home kids). It's been wonderful to open the boys' closet and grab another package of diapers. I think we may be set through the end of the year in that department (thanks, Lida and Da). Oh, the sweet sound of the doorbell as dear friends staged a "Gift and Run". The mastermind behind that one was obviously once a youth pastor. I had to take a picture of that one! The kids were thrilled, go and check out his blog to see an adorable photo of all of them at the park last weekend. I can't say it enough--Thank you! I've tried, poorly, to personally thank each of you. I know I've fallen short; especially since we came home. I've thanked God for your charity and for using each of you to encourage and help us along the way. Have I gushed enough? One last time--Thank you! My morning started early today. Jo woke up and fussed around. Then Eli woke up...and fussed around. I got Jo to sleep, then laid Eli down. Then Jo woke up, but Eli was asleep. I took a minute to check my emails and saw a foreboding message from the Heinrichs (we travelled with them to ET). She wanted to know if we ended up with any bugs. They did. It took a week for the little buggers to show themselves. Flippantly, I replied and told her that we had checked and checked. Still in the clear. Then the girls woke up and greeted me. So sweet, as I hugged Fetya I noticed a little bug on her shoulder. Odd looking little bug, kind of like a tiny spider, or ant? With Alice's message in my mind, I went to the leftover medical stuff from our trip and pulled out the lice comb. Without too much thought I quickly ran it through Fetya's hair along her ear and came out with...bugs. Lots and lots of bugs. Some BIG nasty looking bugs, and some little nasty looking bugs. Definitely an infestation. I checked all the kids. I was a bit frantic, I may add. Jo and I are leaving in two days to go to a very good friend's wedding. I pictured myself showing up with buggy hair. Then I pictured my in laws coming on Saturday and possibly taking home some travelers. They are coming to help Seth with the four big kids while I'm away. What a way to say 'Thank You'! Everyone came out clear. Even me, I dug through my hair with the comb. I'm the one who has cuddled and slept with Fetya...for almost two weeks. I can't imagine those little guys not crawling over to my tempting scalp. So far so good. I slipped into serious mode and barked out orders to the kids. Completely forgetting that Fetya doesn't understand, "Quick, go strip your bed!" After beds were stripped and linens in the basement, I scrambled to the bathroom. All four kids stripped down then scrubbed their heads with the lice shampoo. Still not sure if this is lice, but it's the best guess I have. Then I sat down, still in jammies, and picked through Fetya's hair. Everett documented a good part of the morning. Here we are, spending some good quality time together--chimp style. Nothing says lovin' like having your mom pick bugs out of your hair. Oh, and the baby, gotta have him in there. He CERTAINLY wouldn't be pleased if he wasn't a part of the bug removal process. Nit removing is SO relaxing. Any of you moms who have kiddos that won't go down for a nap? Try this! Jo slept only long enough for me to throw in laundry load number three and mop the kitchen. After that he was ready for some more bug eradication. Here we are enjoying some time together vacuuming up any leftover buggies. I feel so much better drinking calorie loaded frappucino and eating Kisses after the vacuum workout. I get to do this at least twice a day! I finally sat down to answer the phone. Load number 5 is in the washer. I still have at least 2 more loads to go. It was dear hubby on the phone. He was calling to inform me that he's going to be late...very late. So, I'm taking a break. Enjoyed sharing my morning with you--I think I hear the dryer buzzing, back to work! I was stopped the other day on my way into the store by a high school girl. She was conducting a parenting survey and wanted to know if I was a parent. She's asking me that as I'm pulling a child out of the monster van we call Moby. Seemed obvious to me. After many intrusive questions (that I answered because she promised us chips and a soda), she asked some parenting questions. One of them sort of baffled me: What do you most like about being a parent? I couldn't answer. As cheesy as it sounds, I couldn't narrow it down. So I gave her an incredibly lame answer, after doing my famous "uhhhh" for a full 5 seconds. I said, "Oh, lots of things." Then I watched her write that down and thought about how stupid it sounded. It bugged me. Really bugged me. So, today, while feeding Jo, I had a smidge of time to think about a few of the things I love about parenting. Since it's Mother's Day it seems appropriate to share them with you. I know that many of you are wanting deep, introspective things to be posted, but I don't have the fortitude or time for it now. I promise--coming soon! As a tide-me-over, check out the picture of the kids. I lined them up in order (excluding Josiah, since he's obviously not older than Everett) so you could see how Fetya actually is 3 year old size. Planning to just keep her birthday as given--she will be 4 in July. And now for my top 5 "I'm lovin' parenting when..."
1-I can sit and watch my kids play and love on each other. My heart is full to bursting when I watch them enjoy each other. Not to say that I don't get my fair share of playing WITH them, but that is a wee bit different. 2-I catch (on the sly) one of my children making the right decision when the wrong one is soooo enticing. I usually have to fess up on seeing them and I always say, "You bless my heart!" Eli sometimes comes up to me and asks me, "Did I bless your heart then?" Love it! 3-A lightbulb goes off for one of them and they finally 'get' something that they have been struggling with. Learning is really cool; especially when you watch it happen for someone else. I'm a total nerd, I know. 4-I see how much my kids adore Seth. And I see how much he adores them. Don't be misguided and think our house is all just giggles and kisses. We have our fair share of grabbing and smacking, too. 5-Bedtime. I LOVE spending time with each of my children. I honestly enjoy them. Really, I feel like I need to convince everyone of that. I'm not at home because I'm being punished. I like these little people! But, they wear me out. Now that there are 5 of them, they really wear me out. That said, there is immense satisfaction in knowing that each one of the kids is happily tucked into bed. Then I sit and catch up with Seth and peek in on them so cute and cuddly in their jammies. Love it! Okay, I have to add a number 6. I really love to hear my kids pray. We pray at mealtime as a family. We also pray before bed. We listen to each one of them pray and I'm always astounded at what they have going on in their minds. Fetya caught onto our prayer time already (they pray before each meal at Kids Care) and the past few nights she has repeated everything I've said as I'm praying (lots of 'Thank you for...'). Which works. Tonight was better though--she prayed in Amharic by herself after I prayed. I caught some "Mommy, Daddy, Jojo" in there. I didn't understand anything else she said, but I was in awe of this little girl who can adapt so well, so quickly. Here she is talking to God about her family. I love listening to each of my children as they lift each other up to God. I hope everyone has a wonderful Mother's Day! I will work on posting about Fetya's health and the recent not-so-many answers we've gotten regarding that. He's also got a great wife who surprised him with a jersey from Ethiopia. Incidentally--he asked Robel if he could buy a jersey, but Robel was already buying one for me so he told Seth that he was only allowed to purchase one at a time. Seth said he thought it was an awfully strange rule, but just shrugged it off. Fetya found Ella's tea set and made coffee for everyone. "Buna, okay?" Upon discovering mud in the backyard the coffee ceremony went outdoors. Making coffee became very involved--dandilions, dirt, water, and (sadly) foliage from some of the emerging bulbs. Blissful naptime! The big kids haven't taken naps for a while, but wanted to be with their sister. I was overjoyed. Within half an hour of the three kids falling asleep, Josiah woke up. I should have expected that. Just enough time to do a quick run through the house, but not enough time to actually relax. Everett saved the day. He 'begged' to have some quiet time with his baby brother. I, of course, relented. Fetya has fit in so well. When the kids started dressing up, she jumped right in. Considering her affinity for blue jeans, it was surprising to see her don the Tinkerbell costume. Take notice of the matching green jelly shoes (on the wrong feet with mismatched socks). I'm completely exhausted, but want to let everyone know that we made it home. The kids are getting along wonderfully. The flight was long (that is a severe understatement, but my brain is so slow right now that I can't think of anything better to say). The kids were good, within reason, anyway. Josiah pooped his way from Addis Ababa to Rome. We wasted two outfits before we even made it through security in Ethiopia! Fetya started shrieking that she had to go to the bathroom while waiting in the security line. One of the guards just took her out of the line through security....without me! Obviously this wasn't an option in our minds. I shedded as much luggage as I could and (with Josiah strapped to my chest) chased after them. It was chaos! So much happened the last few days, but right now I can't find the time to write about them. Hopefully tomorrow. I did get the pictures off the camera. For all of you who have hounded me about pictures--here are a few! Enjoy! Thank you for your emails and prayers. We were eager to get home, but feel so blessed to have spent a week in Ethiopia. This is about halfway into the trip. Josiah slapped at Fetya's sprite and knocked the whole glass into her lap. Her clean clothes were sitting next to her. They were covered in sprite, too. She changed into them anyway--seeing as they weren't covered in beef and noodle dinner. Oddly enough, Fetya is very picky about what she wears. She refused to wear any capris or pants that weren't made of jean. She didn't particularly care for the sandals or crocs I brought. When given the choice, she donned the light-up power ranger sneakers from the transition home. In clean clothes ready for the last two flights to get home. Josiah didn't make it home in that outfit, he pooped in it shortly before the plane took off. Miraculously, he made it home in the last outfit that I had packed. This is at the park today. Getting the kids to look at the camera isn't impossible, but requires more skill and energy than I had! Tonight, before Seth went off to bed, he said, "This was honestly one of the nicest days of my life." I'm tired beyond belief, but I had to agree with him. I'm finally on the up and up. After living for two days on half a croissant and two peanut butter crackers, my body has overcome whatever I had and I got to enjoy a *bit* of pasta for lunch. Unfortunately, whatever I had has hit Seth. At least half of us have gotten ill on the trip--we are dropping like flies! This morning we visited Kid's Care. Fetya lived in this orphanage from July until our referral. Josiah was there from November until February when both kids were moved to the AWAA home. There are so many children there! The babies...oh...my heart breaks to look at them! The only peace came from knowing that each of the babies we saw today will be placed with a family. The first room we walked into was for babies who need special attention. I kept biting my lip to keep the tears at bay. These babies were so small! The wonderful thing is, Jill Coen's Silas was one of those babies. Right now he's a happy, healthy five month old on his way home. Praise God! We got to video the room that Josiah was in (his nannies all remembered him). Esther, who runs the orphanage, shared the story of how Fetya ended up at Kid's Care. She is truly an amazing woman. She said that Fetya was her little friend, so happy and friendly. This visit was a little bit of a worry to Fetya. She kept her eye on Seth and I the entire time. A few times she called out, "Mommy!" Then ran over to ask me something. We bought fundraiser t-shirts from the orphanage for each of the kids. She was so protective about that! A lot of our 'talking' is pointing and gesturing. When we pointed to the shirt then said "Fetya" she was thrilled! Immediately tugging me over to the van to put it in the 'hello kitty' backpack she's been carrying around. She's also been collecting spare change and storing it in the little pocket! Yesterday, she tried to pay for bananas at the store with her money! We learned that Fetya is most likely from an Oromo Muslim family. The Oromia area is south of Addis. They speak Orominga, a language that is completely different than Amharic. Since July, Fetya has learned Amharic well. She's been impressing us with her English in just the past two days. Every once in a while she throws out a "banana" or "What's that?" Seriously, a trilingual 4 year old?! Anyone out there thinking about adopting an older child...we have met some of the sweetest kids this week. The older children at the AWAA home have families waiting on them. 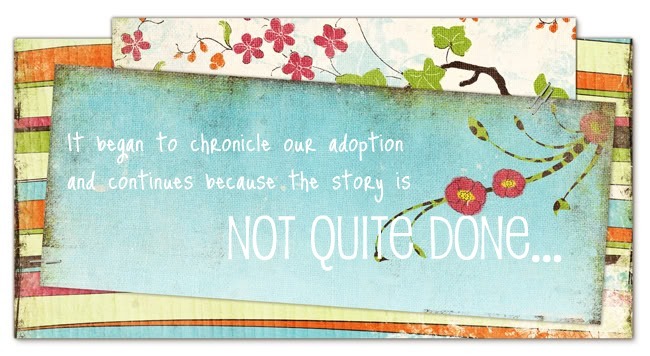 If you are one of those families--you are certain to be blessed by the kids you are adopting. I witnessed so many kind gestures from these children. Fetya was sharing some gum and handed the first piece to an older girl. She immediately passed it to a little boy who was also waiting. They are so loving to the little kids and just want the adults to visit with them a little while. We managed to take video of them so the families with referrals can see their sweet spirits! For anyone who hasn't decided about adopting an older child--there are so many boys and girls at Kid's Care who don't have families. I wish I could post pictures of them; they would steal your hearts! When I started typing both kids were zonked. Josiah has since stirred and is now snoring in my arms. Seth went with Robel to watch some of the races at the stadium. 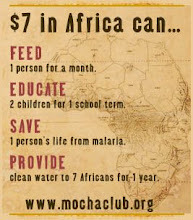 This week there are some African trials (haven't paid much attention since I've been busy with...oh adopting the kids). Typing with one hand is so difficult that I'll have to finish this later!